Whoops! I am falling down on the job! Completely forgot to post this on 1 March! My apologies for being a couple of days late! Once again we had another great month in the challenge with 130 reviews linked up! Wow! 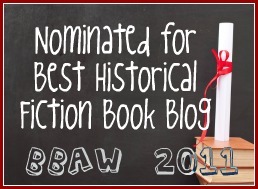 What a start to the year for the Historical Fiction Reading Challenge! There are now more than 280 reviews linked to the challenge during January and February! I wonder if we can maintain that kind of number each month for the rest of the year? It's a tall ask, but it would be awesome if we could! Please leave your links for your February reviews in Mr. Linky below or if you don't have a blog, in the comments below. I will be adding numerous books that I've reviewed since January. Sorry I'm catching up with this challenge. Oh and I'll go for Ancient! People of the Book by Geraldine Brooks is my March selection. I'm behind! I better catch up!